One of the coolest things about the motorcycle industry is the people you meet in it. For most of them, motorcycling isn’t a job, it’s a way of life, and something that they live out even when they clock out. 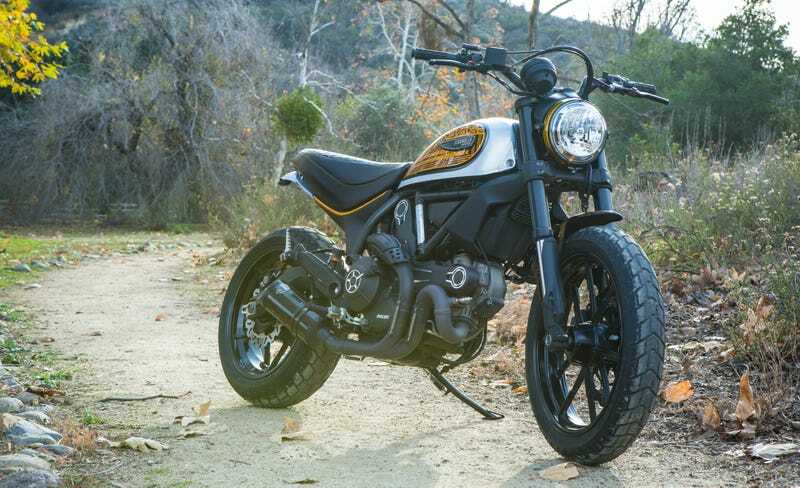 Heath Cofran, who’s a communications pro for gearmaker Alpinestars, is one of the guys, and his Ducati Scrambler is proof of a life obsessed with motorcycles. I remember talking to Heath when Ducati first launched the Scrambler and, after hearing my and some of the other journalists’ opinions, him telling me he was going to buy one. Lots of guys in the industry say stuff like that, but by the time the bike hits dealers, there is usually something else that’s been announced we want to wait for. Heath never wavered, and I remember the day he took delivery of his bike. I remember because it was also the same day as a Hell On Wheels scramble, and Heath told me he’d finally gotten the bike with a picture of him jumping his hours old bike on a dirt track. Heath’s had the bike a while and, as with every bike he’s owned, he’s put a ton of work into it. Stock, the Scrambler is a great platform, but it has a lot that most experienced riders will want to fix. The fueling is super snatchy at low RPMs, the bars are way too high and give you too much leverage, and the foot pegs are slippery. It’s also meant to be a stylish bike, but being stylish is hard when you look the same as everyone else. Luckily, all of those things are pretty easy fixes. For the bars, he swapped for the set from the Scrambler Full Throttle and then cut an inch off the sides to narrow them slightly. Then, the stock exhaust was ditched for a Shift Tech carbon unit and the headers were ceramic coated (as were the bar clamp and speedo gauge cluster bracket.) He added a power commander so smooth the fueling, which also lofts the front wheel much easier. The brakes on the bike are decent, but anyone who likes to ride as spirited as Heath will want to upgrade them. His first step has been to swap for wavy type Galfer rotors, and he has steel braided lines and upgraded pads planned. Shift Tech has a great set of pegs that provide way more grip, and then he finished with Rizoma shorty levers. Style-wise, Heath has always been a very unique individual. He wanted to tap into his Native American roots, while also adding some other bits of himself in. The white base for the bike is actually color matched to the inside of Space Mountain at Disneyland, and the engine cover and fenders are painted in a print that combines Hawaiian petroglyphs and art deco print. The symbol on the wheels is a symbol for “fast.” All of the painting was performed by Anaheim Rod and Custom. Next up was the seat, which both Heath and I agreed looks a little wonky with the curvature of the top. He worked with Arch Motorcycles (Keanu Reeves’ company) to design a new shape that would make it more flat on top, and then he found a set of old Ducati racing leather to use to cover it. The bike is about done, and now Heath says he plans to race it (which will mean even more mods and upgrades.) We grabbed lunch a week or two back and he let me ride it and, while I love the way the power commander and exhaust have added some grunt and smoothed things out, the new bars were my favorite mod he’s done. The put the bars at a perfect height and their narrowness acts a bit like a poor man’s steering damper, which makes the bike much more fun to ride fast. This give any of you with a Scrambler some ideas? Post pics of your Scramblers in the comments below. I love the little Watsen Designs turn signals.